Available in 50 liter and 75 liter capacities. The importance of sterilization is essential to good laboratory practice, particularly in biotechnology, pharmaceutical and clinical laboratories. Of all sterilization methods, high pressure steam (autoclave) is the most widely used because of its efficacy, speed and reliability. SANYO MLS-Series top-loading autoclaves provide a safe, reliable high pressure steam sterilizing environment within a self-contained unit that is particularly easy to use. These reliable, energy saving autoclaves are ideal for a wide range of applications. Microprocessor controls Assure that the correct temperature is accurately maintained and easily operated with one-touch operation. The top of the autoclave chamber is only 641 millimeters from the floor. This low-profile deign makes it very easy to load the sterilizing baskets (MLS-3750). The door opens upwards, so no slide open space is required. This makes the 37-centimeter wide chamber easy to access, and a low-profile design is also made possible. 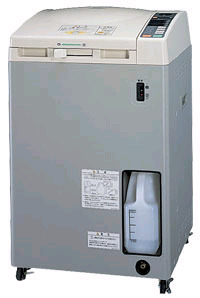 The MLS-3780 offers 75-litre capacity with the same footprint as the MLS-3750. The 14.5" (37cm) diameter wide chamber offers ample capacity. Up to four 1000ml flasks will fit easily into one sterilizing basket. Also, two racks holding 50 test tubes can fit into one basket. The MLR-3750 can hold up to three baskets at one time. Sterilizing temperature is controlled by microprocessor to within +2°C/-0°C of the set temperature in the range of 105°C to 135°C. To ensure the safe operation of this high-temperature, high-pressure autoclave, the chamber and the open/close lever are controlled by a double interlock system dependant on temperature and pressure sensors. In this way, it is impossible to open the autoclave until temperature and pressure levels are safe. The exhaust valve release temperature can be set to allow automatic release after the sterilizing cycle has been completed. The setting range is from +0°C to 25°C above boiling point to suit the items being sterilized (patent pending). 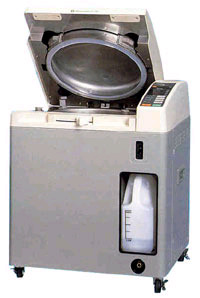 SANYO has included a host of features to make this autoclave user friendly. A heat-insulating resin coating and corners are gently rounded to simplify cleaning. The control panel is mounted on top so its easier to see and use. A clip-on drainage hose and an exhaust air tank simplifies filling and emptying. The lever locking system offers additional safety. Pre-sets are programmed for sterilizing, preparing and maintaining culture media. Four courses with three variations offer a total of 12 programs. Sterilization Intended for fluids, including water, culture media and reagents. After sterilization is completed and the contents have cooled down naturally to the selected temperature, air is expelled from the chamber automatically through the exhaust valve. This course is suitable for BGLB culture media and for Durham tubes*. Sterilization temperature: 105°C to 135°C. Sterilization timer: 1 to 250 minutes. Exhaust temperature:+0°C to 25°C. *For E. coil tests. Melting/Keep Warm Course Used to dissolve culture media or keep them at a fixed temperature. Keeping dissolved media hot prevents them from solidifying (this is not a sterilization course). Breakdown temperature: 60°C to 100°C. Sterilization timer: 0 to 250 minutes, 72 hours. Incubation temperature: 45°C to 60°C. Sterilizing/Keep Warm Course To sterilize culture media, reagents and other liquid substances, then keep them at a high temperature. After sterilization is completed and the contents have cooled down naturally to the selected temperature, air is expelled from the chamber automatically through the exhaust valve. 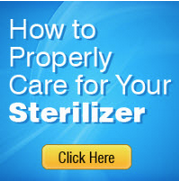 Sterilized media are maintained at a high temperature to prevent them from solidifying. Suitable for BGLB culture media for Durham tubes. Sterilization temperature: 105°C to 135°C. Sterilization timer: 1 to 250 minutes. Exhaust temperature: +0°C to 25°C. Incubation temperature: 45°C to 60°C. Instrument Sterilization Course For sterilizing flasks, beakers, test tubes and other laboratory instruments and equipment. After sterilization is completed, the exhaust valve opens and the temperature drops to 100°C. Suitable for appliances that can withstand sharp drops in pressure and also for sterilizing waste products. Sterilization temperature: 105°C to 135°C. Sterilization timer: 1 to 250 minutes, 72 hours. External Dimensions (W x H x D) 23.6" x 29.7" x 22.0"
(600 x 754 x 560mm) 23.6" x 38.5" x 22.0"
23.6" x 29.7" x 22.0"